The Eco Air ECO14LDF Dehumidifier is a capable and stylish dehumidifier for use in the home. The ECO14LDF is a small to medium capacity unit suitable for areas up to 20m2 (approx. 215 sq ft). This dehumidifier will be capable, therefore, of controlling humidity in a single room or a compact, one bedroom apartment. This is the smaller of the two models in the "F" range of Eco Air dehumidifiers and the more powerful ECO20LDF is an option if you have a larger area to dehumidify. The Eco Air ECO14LDF Dehumidifier is a compact unit standing just 50.5cm (c. 20inches) high and with a foot-print just 21.5 x 32.5cm. These modest dimensions are ideal for areas where space is limited and allow the dehumidifier to be located unobtrusively in any room. If you wish to move the dehumidifier from room to room, or take it up or down stairs, you will be pleasantly surprised to find that it weighs a manageable 10.5Kg, around the weight of a typical upright vacuum cleaner. Refrigerant dehumidifiers are always rather heavy for their size due to the weight of the refrigeration components but this is a relatively light unit for its capacity. A top-mounted carrying handle and castor wheels make movement as simple as possible and this is a truly portable dehumidifier. Water extraction rates for dehumidifiers are invariably tested under conditions of warmth and relative humidity which one commentator described as being "...found only in a tropical rain forest." As temperature and relative humidity fall the amount of water removed from the air falls too so the quoted rate of 14 litres per day at 30°C and 80% relative humidity is unlikely ever to be achieved in the British climate. In Britain most manufacturers quote their figures at or around these conditions so the stated extraction rates will allow a fair comparison to be made between different makes and models. In practice the amount of water you will actually empty from the bucket may be only one third to one quarter of the stated rate. One very positive comment that can be made is that, if the dehumidifier is controlling relative humidity to a lower level than before you bought the appliance it should be extracting less moisture, it's a sign that it's working! The water collection container, or bucket, will hold 2.7 litres of water and will need to be emptied once or twice per day. If you should forget it will not overflow on to the carpet as the Eco Air ECO14LDF Dehumidifier has an automatic cut-off switch to prevent this. If you would prefer to be spared this chore, or wish to ensure the unit keeps operating while you are away from home, the ECO14LDF is configured for continuous drainage. A small plastic hose may be attached to a water outlet on the unit and run to a nearby drain. Drainage is by means of a gravity feed so the drain must be lower than the outlet on the dehumidifier and you may find it helpful to mount the unit on a surface above floor level to assist the flow. Continuous drainage alone is not sufficient for unattended operation as there is always a small risk of an interruption to the electricity supply while you are away. The Eco Air ECO14LDF Dehumidifier is prepared for this event and has an auto-restart facility which switches the unit back on when power is restored. This is not an uncommon feature in a dehumidifier but is less common in units at the less expensive end of the market, such as the ECO14LDF. The Eco Air ECO14LDF incorporates a humidistat to control the level of relative humidity to your preferred level. Apart from your personal comfort humidity control, to 50% or a little less, is essential to prevent mold growth and to control dust mites. If you are allergic to one or both of these unwelcome visitors this will be of particular concern. For greater assurance it may be a wise precaution to check the relative humidity in the critical area with a hygrometer, a device that records relative humidity. This is a competitively priced dehumidifier and the components are unlikely to be as sophisticated as those in a higher priced dehumidifier. 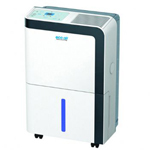 The operating temperature range of the Eco Air ECO14LDF Dehumidifier is 5°C to 35°C. This should not be taken to imply that the unit is suitable for continual use in a low temperature environment, such as a garage. Most dehumidifiers have a sensor which tells them when ice is forming on the cold coil, which will happen at any room temperature from about 20°C downwards. This sensor will automatically stop the dehumidifier from operating until the ice has melted, which is what is meant by auto-defrost. More sophisticated refrigerant dehumidifiers have an active defrosting system which directs warm air across the coil to melt the ice, a so called "hot gas defrost" system. A refrigerant dehumidifier equipped with hot gas defrost, or a desiccant model, will be needed for effective use in a garage, on a boat, or anywhere else where the ambient temperature may be significantly below normal room temperature for long periods. Noise is always an issue with dehumidifiers and the main source of noise is the fan that draws in moist air and expels dried air. Even desiccant dehumidifiers have fans, two rather than one. An added source of noise in a refrigerant dehumidifier is the compressor but this is the lesser of the two noise-makers. It is regrettable but asking for a quiet dehumidifier is like asking for a quiet baby. A quiet baby is noisy, she or he just makes less noise than a loud baby. The Eco Air ECO14LDF Dehumidifier is a "quiet baby" but take any sales-talk about "whisper quiet" dehumidifiers with a pinch of salt. The noise output of this unit is 45 dB, which is quieter than some but may still be intrusive in some circumstances. The difficult question is whether the noise of any dehumidifier is a price worth paying for comfort and reduced condensation, a matter for each individual.